Dr John Rengen Virapen, former Eli Lilly executive confesses that he bribed the Swedish government to approve Prozac, in order to advance his career at Eli Lilly. Now that he has retired and has a son of his own, he is working to fight mandatory vaccinations in Germany. All this and more is covered in his book: Side Effects: Death - Confessions of a Pharma-Insider. Gwen Olsen's book is Confessions of an Rx Drug Pusher. The $20 billion in civil and criminal penalties that Big Pharma has paid over the past 20 years is simply written off as "the cost of doing business." I have started to tell people about a public education campaign I'm launching soon. So the heat is being turned up. But it inspired me to write this. It is long but please bare with me. I feel it's important to be transparent as to why I do what I do. What if you were offered three jobs and chose the company you did because they seemed the most ethical. What if you researched their charity efforts at stopping a river blindness disease in Africa before you committed, just to make sure they were honorable. What if you then spent two months of your life away from family and friends with 40 others spending, 10 hours a day being told how great something is and how to sell it to everyone under the sun, including doctors. What if you really believed, at 25 years old, you thought you were actually helping people who were in pain. What if you then won sales awards because you got more doctors to prescribe this product and ultimately, in your mind, help more people with arthritis. What if you then told your grandmother -- the most important person in your life -- to ask her doctor to switch her to your product and she DID. What if then everything started to unravel before your eyes. What if you then realized EVERYTHING you were told and then TOLD OTHERS was a LIE. What if really shady things started to happen? What if you heard things on the inside that were being hidden from those on the outside. What if you then realized you were a PART of an industry selling a drug that had, in fact, unnecessarily killed people. What if you then wondered not IF but HOW MUCH blood you have on your hands. What if you then realized your grandmother who raised you was on that SAME drug. What if that drug then becomes the LARGEST DRUG RECALL IN US HISTORY (but you had already seen enough and left the company by then). What if you then learned this drug KILLED TENS OF THOUSANDS OF PEOPLE? What if then you got a little PISSED OFF about all that and what if you realized once you know the truth, you could NEVER go back. What would you do twelve years later when you saw that those SAME doctors were pushing other drugs that were harming people at ALARMING RATES yet saying they were completely SAFE? What if you knew ALL THEIR INFO was coming from the industry that profits off the drug (because vaccine reps had the easiest jobs in pharma and other reps laughed about it)? 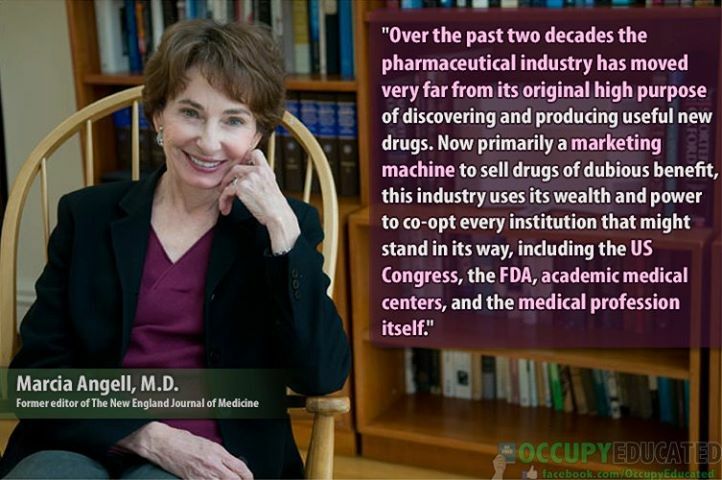 What if you knew these drugs were not nearly as scrutinized as the drug you sold that KILLED people? What if you then met many people, in person, whose kids WERE KILLED by these drugs, and most doctors are claiming the drugs are safe when independent studies clearly were showing otherwise. And because you know the drug companies sponsored ALL of the so-called "safety" studies and they taught you how to read them so you know what a real safety study looks like, you feel compelled to speak out, especially because this time those drugs are HURTING KIDS. You see it all around you with record numbers of childhood illness and disorders, the true epidemics in this country, AND NOW they want your child too because you did the research that most don't and saw that these drugs had the potential to do far MORE HARM THAN GOOD. And then you realize it's the SAME company that you worked for. WHAT WOULD YOU DO IF YOU WERE ME?!! People ask me all the time why I now actively speak out against VACCINES and the industry that makes billions of dollars off of them at the expense of our children. I always answer: how could I NOT?!! I know too much to turn the other way or stay silent, even with all the attacks I receive on a near daily basis. A generation of children, which includes my son, is at stake. And their health matters to me. I am certainly not speaking up for money or fame. I don't take a salary, I make absolutely NO money related to this movement. I am extremely blessed to say I have alternative resources for now, although tens of thousands of my own money have gone into this movement. Fortunately, it does allow me to honestly say that EVERY cent of EVERY donation goes directly to this cause. As for the "fame," anyone who says I'm in this for fame clearly has no idea WHO they are talking about, and I would seriously question who THEY are working for. I was (mostly) raised by a staunchly conservative, Presbyterian, extremely private and amazingly strong woman; my grandmother. The kind of woman who had the means and love for travel, but rarely did because of her strong work ethic and professionalism. She was high up in the administration for a major university for 40 years. She divorced my alcoholic grandfather back in the 50s when that was frowned upon and raised my mother on her own. She was an amazingly, solid and reserved woman. She taught me strength, she taught me integrity, she taught me professionalism and she taught me to be a VERY PRIVATE person. Luckily, one lesson didn't stick: to obey authority. I was and still am the type that, when told what to do, I don't say "ok", I ask "why should I?" I was told many times in my life that I should be in Hollywood, that I should be an actress. But I would laugh and say: "There is no way I would EVER want to be famous." I don't want to live life under a microscope. I don't want to always feel like I'm being watched. I don't want anyone outside my immediate circle to even know my name. These are just a few of the reasons I did NOT want to get involved with the vaccine issue publicly. I knew that I would ultimately be living life under a microscope. I had been in the industry long enough to know why hardly anyone speaks out against it. To me, fame makes no difference. I don't care if you're Brad Pitt or the stocker at Trader Joes. The most important thing is your character and your heart. To me, the most powerful people in this world are the ones who live in truth, integrity and with compassion; honoring their own truth and that of the world. I knew my story was powerful, but like many others, I wanted to stay behind the scenes and lead by example. The spotlight is not something I wanted to throw myself into. With it comes that feeling of having to look over your shoulder. I've been insulted, harassed, intimidated, threatened; all because I want to save our children from a lifetime of suffering from autoimmune issues, from ear infections, from allergies, from asthma, from developmental disabilities, from ADHD, from heavy-metal induced brain damage, from leukemia, from diabetes, from death (SIDs). But I'm tired of ALL THE LIES. The chemical additives in vaccines have absolutely no place in the human body and are causing irreparable damage to a lot of people. Once you know how to spot it, you can see vaccine injuries all around the playground. No amount is safe. We all have a different chemical threshold that we can handle and chemicals come from everything around us but vaccines are injected so they go straight to the vital organs, which is a big difference. And the chemicals accumulate. You never know what will tip the balance and lead to issues, sometimes massive, lifelong issues. We are being lied to for profit: vaccines are NOT safe as they lead us to believe. The pharma-funded safety studies do not use real placebos. There are too many, too soon and this entire generation of children is suffering because of it. People have the RIGHT to know the risks before they do something that may change their lives forever; or the life of their innocent, healthy child. It should be the EDUCATED choice of the parent and/or person being vaccinated, NOT THE GOVERNMENT OR PHARMA. In February 2015, I learned about SB277 in my home state of California, and I knew the real reason behind it: PROFIT. The pharmaceutical drug market is saturated and full of liability, while the vaccine market is the exact opposite. There are more than 271 vaccines under development and they are targeting mandatory vaccines for adults soon, there's already a plan at the federal level. Before I made the decision to get involved, I cried for a month because I instinctively knew that life as I knew it --which was easy and relatively carefree-- was over. I would very quickly fall onto the radar of those who would never allow my life to be easy again. But it was time to speak up. And I will not STOP speaking up. All the pieces of my life have fallen together. I now know why I worked for pharma, which was a random suggestion from a friend. I know why I did three years of biochemistry in college. Why I lived in Europe so I could see things from a different perspective; one where pharma doesn't drive the agenda (for now). Why I had my surprise son at the time I did. Why I had him in a natural, midwife led home birth. Why I made the decision to move back to CA after 8 years in Europe. Again, the pieces are falling together. Everything I have gone through in my life has been in preparation for this moment. This is why I am who I am. This is why I am here in this world at this exact time. This is my calling, my purpose. In fact, I often feel like this work is being done through me, not actually by me. I feel like I am floating in a river just going with the current. I don't even have to swim and I'm fully in the flow. I honored to be a part of such a passionate, eloquent, educated and fierce movement of parents who will protect their children no matter what; unfortunately because most often, they have seen the devastating effects of vaccine toxicity firsthand. And I walk alongside some of the most amazing warriors --doctors, nurses, scientists and truth speakers-- and I am honored to be chosen for this work. I hear lots stories from those whose children have been injured, or in the worst cases, died as a result of vaccines. These stories keep me going through the challenging times. Most of all, I just have to keep the faith and remember that everything is unfolding as it needs to right now. And I'm a true believer in KARMA. Even if there has to be more darkness before the light, I will continue to shine the light. So others that are coming out of the darkness know where to go. The truth WILL come out. It's only a matter of time. We are part of a revolution based on freedom and health, where courage will conquer fear. Where COMPASSION WILL CONQUER hate. Where integrity will conquer greed. Where health will conquer illness. Where TRUTH WILL CONQUER their lies. And where LOVE WILL CONQUER IT ALL. I choose courage. I choose compassion. I choose integrity. I choose health. I choose honesty. And most of all, I CHOOSE LOVE. PLEASE JOIN ME - B.V.
From Science for Sale by Dr David Lewis: "...what has been neglected in this debate largely is the overshadowing role that the federal government plays - is something that President Eisenhower actually warned about when he left office. He talked about how the federal government was beginning to put so much funding into universities to do studies that the government was interested in the outcome that that eventually was going to create a situation where science would be largely controlled by the federal government. And, so, having worked as a government scientist myself for over 30 years, I saw this developing within the US Environmental Protection Agency. I also saw it as I interacted with the CDC in Atlanta and other federal agencies such as the Department of Agriculture: There has been an evolution of government intervention in science over the last 30 years that I think clearly has reached the stage that President Eisenhower warned about - that is, much of what you read in the scientific literature that has been funded by the federal government -- some agency - is actually engineered to produce results that support certain government policies and industry practices, and that is an area that is heavily impacting research on autism, which is really why I wrote this book." Trust scientific medical studies? Well, you shouldn't. The latest report out from Albert Einstein College of Medicine takes a look at why scientific medical studies were retracted. In reviewing cases of retractions of scientific papers reported by the DHS supported United States Office of Research Integrity, researchers determined that fraud was involved in 94% of the cases. Here's just one example of a published conclusion that did not reflect the study data: The study tested the rate of miscarriage after HPV vaccination, and a 14.7% rate of miscarriage was observed. They administered a Hep A vaccine to the control group (scientific fraud because the control should receive an inert substance), and a 9.1% miscarriage rate was observed in the Hep A vaccinated women. Their published conclusion: "There is no evidence overall for an association between HPV vaccination and risk of miscarriage." They arrived at that using the "logic" that 14.7 is not much higher than 9.1! This fraud is referenced in a criminal complaint filed against Merck-Sanofi Pasteur Labs. Another example is with the safety studies for the HIB vaccine. The testing was done in New Zealand, and the doctors there reported to the IOM that there were significant adverse events following vaccination of the test subjects. But when the CDC released their final report, they wrote that "no adverse events" were reported. Remember this when you hear sound-bites on the news about a study showing no link between a vaccine and certain adverse events. If we look closely at the fundamental dogmas of modern medicine, we find that most are not even proven, but simply conjecture. Why would "scientists" do that? Because, if they assume a theory is true, it enables them to develop and sell drugs to address the disease based on that theory. Of course, if the theory is incorrect, then the drugs will not work, but before that fact is widely publicized, the drug maker will be able to make hundreds of millions of dollars. Example: The Hepatitis C vaccine. But does Hep C exist? Or did they simply find a genetic marker, and declare that marker to be synonymous with Hep C? That's what they did. So anyone with that genetic marker is then declared to have Hep C. But scientists have never isolated a Hep C virus, which is a requirement to verify the existance of a virus. See the following video for details. Modern Virology: Science or Conjecture?